North Carolina's Drill 187 have been cranking out volatile metal for a few years now unbeknownst to the seemingly deaf indie and major label A&R guys. Why else would a band with songs as strong as these not have a label yet? If their name sounds familiar, it's most likely because of the intense buzz working its way via word of mouth through the metal masses nationwide. Last year I had the opportunity to review both their six song and four song demos and had figured this was their year to be jamming on the second stage at Ozzfest. When I heard their first full length was complete, I was shaking with anticipation. When the disc arrived I was completely blown away. "The Faceless Majority" contains twelve searing tracks that melted my speakers into a waxy globular mound. Two of these appeared on their first demo and were remixed ("187" and "Mankind"), while all four songs from their second demo were here too, including the anthemic pit starter "Despise" as well as "Snakebite," "Syphon" and "Run." The six new tracks took Drill 187 to another level of heaviness that the old tunes hadn't quite reached. This progression is very evident on the opener, "Scrape It Off," which recently appeared on a compilation CD with a handful of signed acts. Pretty impressive for an unknown quartet from the Tar Heel state. Vocalist Jason Lilley showcases his range as they try their hand at a power ballad entitled "Shine." This isn’t your traditional sappy love oozing lyrical charade. "Shine" casts a much darker shadow, much like Pantera's "Cemetery Gates." Jason and guitarist/backing vox Jason Ussery combine for some truly haunting harmonies. My twisted mind hears a strange combination of Slaughter meets the Bee Gees amidst a very apocalyptic soundscape with some Manson style riffing. Trust me when I say it's very cool and very heavy. Other new offerings include the thrashy "Identity One," the Anti-Christ era Manson dirge of "My Damnation," the infectious grooves of "Lethal" and the White Zombie meets Metallica closer, "Fallen." Overall, this of one of the BEST CDs I have ever heard. It is strong from start to finish and will not disappoint. Jason U's shredding solos and chords dominate and are complemented nicely by drummer Greg Evans and bassist Matt Frederick. 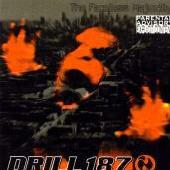 Drill 187 successfully blends a variety of influences to create a sound that is still surprisingly all their own! Drill 187: Jason Lilley; Vocals, Jason Ussery; Guitar/backing vocals, Matt Frederick; Bass, Greg Evans; Drums. Check 'em out at: http://www.drill187.com. Hailing from Rocky Mount, North Carolina, this quartet has already received a tremendous amount of positive press and is poised to ink a record deal. Presenting an impressive press kit, and selling over 2000 copies of their first demo, these "right coast" heavy hitters are ready for the challenge. Featuring Jason & Jason (gotta love that), specifically Jason Lilley on vox and Jason Ussery on guitar, and a solid rhythm section consisting of timekeeper Greg Evans and bassist Josh St. Dennis, Drill 187 offers up a huge plate of metal spaghetti with some mongo "metalballs" to boot. I devoured my plate heartily, treated to 5 tracks on the first course and 4 newer ones for dessert. My feast started off strong with a song called "Divine." Very heavy on the guitar, somewhat reminiscent of Pantera. Driving vocals and gang shouted choruses added some spice that I haven't tasted in awhile. Track 2 entitled "187" led me down a similar path. This song is meant for their live show as a shout-along metal anthem. Next up was "Mankind," my favorite track on the CD. Blending Slayer-like riffs at breakneck speed, this tune grabbed me by the balls and shook me like Korn's ragdoll. It switches from speed metal to slow, crunching doom metal. Definitely a pit starter! "Downtime" picks up where we left off as the last cut "Nine," brings a filling end to this metal smorgasbord as Jason Lilley and company deliver some serious Layne Staley a la Alice in Chains style vocals. I also heard something I thought to be extinct: a guitar solo that really smoked! Do I have room for dessert? Hell yeah!! Demo 2 offered up 4 blistering tracks. First came "Despise." This demo was recorded a year after their initial offering and you can tell. The riffs and vocals are tighter and more refined. I can see how much they have matured after getting more playing time together. "Snakebite" was next, re-scorching my already burning ears. By now I realized there was no turning back. Drill 187 had captured my soul and was dragging it down to the abyss, but I wasn't kicking and screaming, I was banging my head! "Syphon" pushed me further over the edge, as I was barraged by more killer riffs and a Lajon Witherspoon-type vocal wail. The last track "Run" had me feeling angry and defiant, yet was another excellent shout-along anthem. I was very impressed with both of these CDs. Drill 187 blend many diverse influences into their own unique sound. Jason Lilley's vocal recipe: Take 2 cups of himself, add 1 cup of Rob Zombie, 1 cup Lajon Witherspoon and a dash of Layne Staley. Then mix in a blender filled with gravel. Jason Ussery's fretwork was fast and furious, complemented well by Greg and Josh's steady, crunching rhythms. These guys are extremely tight and both demos sound very professional, like they were produced by GGGarth or Ross Robinson maybe. Check Drill 187 out at: http://www.raleighmusic.com/drill187/. Revised: 25 May 2003 00:49:24 -0500.